A new mashup video combines the brilliance of Steven Spielberg's E.T. with Wes Craven's horror classic A Nightmare on Elm Street to deliver something that is the best of both worlds. Both of these movies, in their own very different ways, are certifiable 80s classics in their own right. The former remains one of the finest works ever from one of cinema's most respected directors, while the other birthed a horror icon who remains a fixture in the pop culture landscape to this day. So what happens when two diametrically opposed things such as these are thrown in a blender together? This video provides an answer. 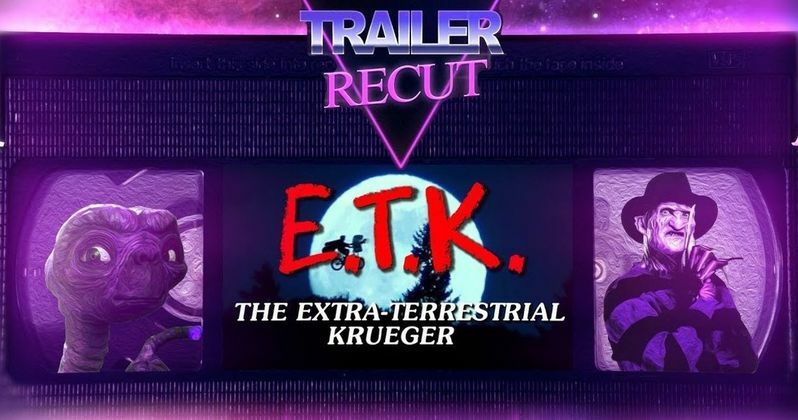 The result is titled E.T.K: The Extra-Terrestrial Krueger, as it swaps out the titular character from E.T. the Extra-Terrestrial in favor of making Robert Englund's Freddy Krueger an alien from space, as opposed to a former pervert who was killed by a small town community and came back from the dead to haunt the nightmares of various teenagers. The video, at first, attempts to somewhat earnestly transform E.T. into a horror movie by making Krueger the focus. And it works quite well. But about midway through, they embrace the ridiculousness of the premise and it turns into a full-on joke, with some pretty decent gags peppered in, such as Freddy saying "Elliot" on repeat and Elliot calling him out for dropping an F-bomb. The video sets up the premise with a pretty simple line. "Every child wants a pet alien. But what if the pet alien was a nightmare?" One of the most surprising elements of this mashup is how well, just presented under a slightly different context, so much of E.T. works as a horror movie. Then again, quite a few people who grew up with the movie will surely tell you that it scared them when they were younger. Freddy Krueger has been quippy for much of his existence, so the fact that his bits of comedy work pretty well may not be quite as shocking. As for when we could possibly see something new and official out in the world from either of these franchises? With E.T., Drew Barrymore, who starred in the movie, said last year that there will never be a sequel. So, unless J.J. Abrams throws us all a curveball and brings back E.T. 's race of aliens in Star Wars 9, nothing is happening on that front. A Nightmare on Elm Street is a very different story. A reboot is still being worked on by Aquaman and The Conjuring 2 writer David Leslie Johnson}, but there is no word on when we may actually see that project take shape. And Robert Englund did suit up as Freddy one last time for The Goldbergs Halloween special last year. For now, this mashup will have to do. Be sure to check it out from the Space Taste YouTube channel below.